Buff-it-Up will boost the KH (carbonate hardness) in your pond which will bring your pH to a safe level. Supports and helps grow the life saving beneficial bacteria in your pond filter, which require carbonates “KH” and a calcium source to flourish. 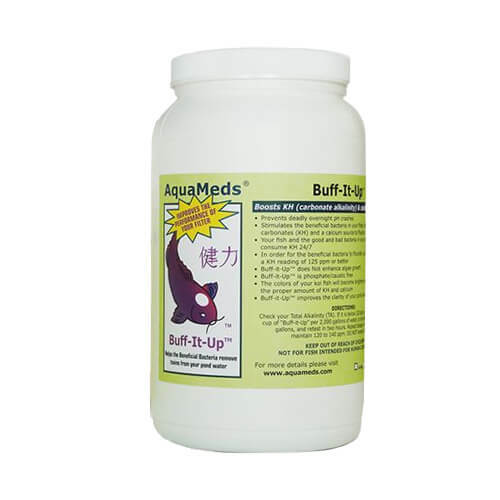 Buff-it-Up is an excellent calcium source, is gentle, safe, and enhances the freshwater environment. Question: How much pond water will this product treat per pound? Answer: There is no set amount of Buff-it- Up that should be used for all ponds. It could take four cups or more of buffer for yours to hold the same pH. It is gentle, safe, and enhances the freshwater environment. Check your total alkalinity, if it is below 120 ppm, add one measuring cup of Buff-it-Up per 2,000 gallons of water, or one tablespoon per 125 gallons and recheck total alkalinity 2 hours later. An ideal total alkalinity would be 120-240 ppm.